» Review: The Frigidaire FGGF3059TF 30 Inch Convection Range & What Happened To The FGGF3058RF & FGGF3054MF? You may be looking for the FGGF3054MF, or the FGGF3058RF and not realize that both the FGGF3054MF and the FGGF3058RF were both discontinued. If you’re in a hurry, see the FGGF3059TF on Abt.com (BBB rated A+) with a low price guarantee, free shipping and extended warranty options here. See more about trusted online retailer Abt at the bottom of this review. You can read through the review or use the table of contents below to skip to a topic you might be most interested in. What Changes Were Made In The Surface Burners? What is the FGGF3059TF Frigidaire Gallery Range? What Does The FGGF3059TF Feature? What’s On The Top Of The Range? What Are The BTUs Of Each Burner And The Griddle? What About The Convection Cooking? What About Non-Convection Cooking Modes? How Does The Temperature Probe Work? 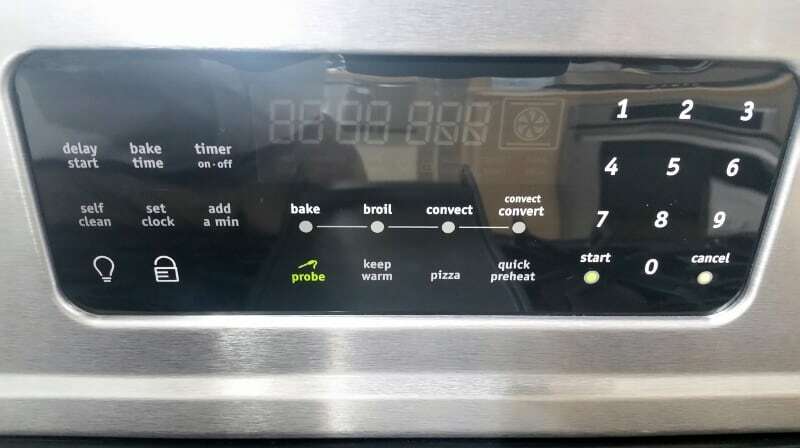 What Other Oven Controls Are There? Is This Range Star K Compliant? Can I See My Food While Its Cooking Without Opening The Oven Door? What About The Storage Drawer? What Are The Exterior Measurements? The Frigidaire Gallery FGGF3059TF has some improvements over the FGGF3058RF and FGGF3054MF. The most interesting improvement may be in the new steam cleaning function in the FGGF3059TF. Other changes were made to the burner power in the left rear and right front positions. The left rear burner power in the new range was increased from 12,000 BTUs in the FGGF3058RF to 14,000 BTUs. The highest power burner, however, 18,000 BTUs in the right front burner in the FGGF3059TF, same as in the FGGF3058RF and an increase from 17,000 BTUs in the FGGF3054MF. This high power burner is great for searing or even wok cooking (you’ll need a wok accessory). It’s great to have a “go-to” high powered super-burner on your range, you never know when you’re going to need it! The Frigidaire FGGF3059TF is a 30 inch-wide range and is part of Frigidaire’s “Gallery” generation of kitchen appliances. These appliances include smudge proof stainless steel finishes, like this range, the FGGF3059TF. You may have even seen Frigidaire Gallery appliances on the “Rachael Ray Show“, where Frigidaire Gallery wall ovens have been featured. If you are familiar with FGGF3054MF or FGGF3058RF, you will recognize many of the same features in the FGGF3059TF, these older ranges are almost the same except for steam cleaning and burner power. Both the FGGF3054MF and FGGF3058RF have recently been discontinued by Frigidaire. The FGGF3059TF is the replacement model. The Frigidaire history starts way back in 1916 in Fort Wayne, Indiana. The company was founded as the Guardian Frigerator Company, one of the first refrigerator manufacturers. An early investor in the company and the founder of General Motors, William Durant, renamed the company Frigidaire after he acquired it in 1918 on behalf of General Motors. General Motors thereafter owned Frigidaire for many years. White Consolidated Industries (WCI) then acquired the division from General Motors in 1979. Frigidaire became a subsidiary of Swedish appliance conglomerate Electrolux in 1986 when Electrolux acquired WCI. Frigidaire remains its own separate division of Electrolux and is headquartered in Charlotte, North Carolina. In addition to refrigeration, Frigidaire was also a pioneer in range ovens, it produced one of the first compact 30 inch ranges in 1950. Frigidaire ranges are assembled, designed and engineering in the United States. Frigidaire’s location in the U.S. makes sense given that the U.S. is Frigidaire’s largest market. From its US location, Frigidaire continuously improves its products to match its customer’s demands. 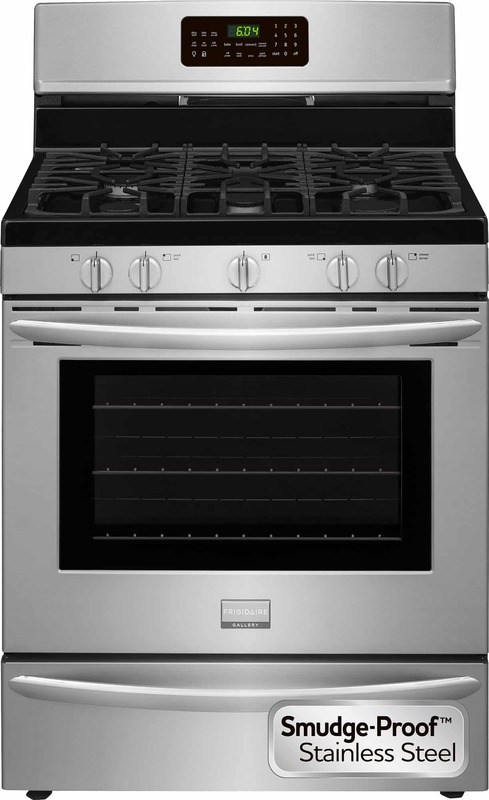 The FGGF3059TF range has five burners on the rangetop and a big convection oven below. The burners have a wide range of power, from 5,000 to 18,000 BTUs. The oven includes a convection fan with its own built-in electric heating element. This built in heating element makes the convection system in this range “True Convection”. True convection ovens have this heating element, while many other ranges just have the fan without a built-in heating element. Although these manufacturers bill their ovens “convection” ovens, without the heating element they are not true convection ovens. The FGGF3059TF also includes an “Effortless Temperature Probe”, like the temperature probe in the FGGF3058RF and FGGF3054MF. 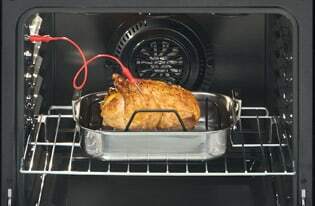 This oven thermometer connects to the control panel through the oven and, when inserted into your favorite roast, or anything else, alerts you when your food is ready. The probe measures the internal temperature of your food and alerts you when it reaches your target temperature. The oven then automatically switches to “warm” and stops cooking. This is a great feature to have, you can “set and almost forget”. All you have to do is set your target temperature and relax. The oven will know when you food is cooked (make sure you choose the right temperature) and automatically keep your food warm without over-cooking. As noted above, the exterior finish of the range is “smudge proof” stainless steel designed to resist fingerprint marks, just like the older models. Another great feature in this range is the Quick Preheat features which will get the oven up to cooking temperatures much faster than without it. It just takes minutes to get to cooking temperatures with Quick Preheat. The five burners on the rangetop are topped by three continuous cast iron, black matte grates that provide a smooth surface across the rangetop. This continuous surface makes it easy to move hot, heavy cookware around the top of your range while cooking multiple dishes. The right front burner is the most powerful, with 18,000 BTUs of burner power. This power sear burner is great for rapid boiling, quick sears or even wok cooking with an additional wok accessory that is not included. The right rear burner is 5,000 BTUs and is the simmer burner, designed for delicate cooking applications like melting chocolate or simmering sauces. The left front burner is 9,500 BTUs and the left rear burner is 12,500 BTUs (14,000 BTUs in the FGGF3059TF). The center burner is 10,000 BTUs. The center 10,000 BTU burner may also be used with an included cast iron griddle that replaces the center grate when you use it. The griddle basically covers the area of a little less than 1/3 of the rangetop. It’s not a large cooktop, so take that into consideration. There are optional larger griddle accessories available. Each of these burners are sealed burners, common in home ranges. The alternative to sealed burners, open burners, are typically found in commercial kitchens or in some pro style home ranges. Open burners are usually more powerful and a little less safe than most home cooks would need or want since they are typically designed as an open flame “torch” coming out of the burner. Like the discontinued models, the FGGF3059TF oven is a large, 5 cubic foot gas powered convection oven with multiple cooking modes and timer features. That’s a big oven and will fit a large turkey, or almost any other of the largest things you ever cook. It also includes a temperature probe and self cleaning. The interior is 24 3/8 inches wide, good for large cookie racks, 18 5/8 inches high and 19 1/8 inches deep, just like the interior of the FGGF3054MF. The broil burner is 13,500 BTUs, located in the top of the oven and is designed to sear food placed closed to it in the upper rack position. Variable broil settings from 400 degrees to 550 degrees Fahrenheit (the maximum temperature setting for the oven) may be made in ten degree increments. This gives you a lot of temperature control. 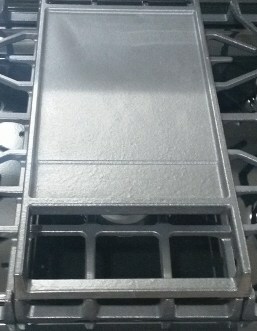 The bake burner is 18,000 BTUs and located in the bottom of the oven. The convection system in the FGGF3059TF is “true convection” because the convection fan includes its own electric heating element. 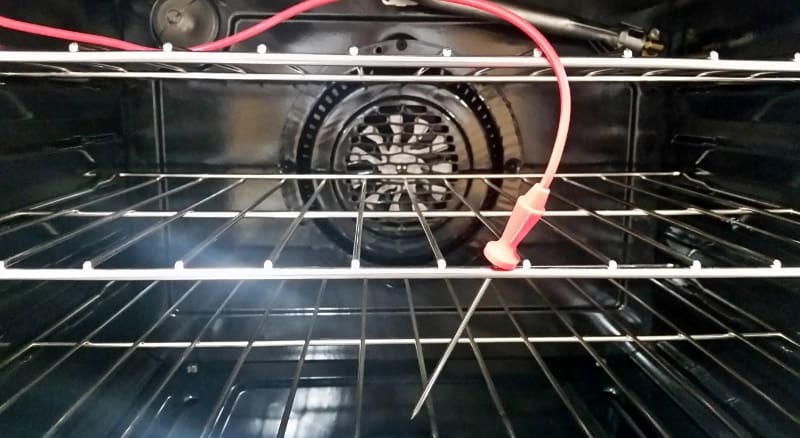 This built in heating element with the convection fan will better circulate heated oven air evenly throughout the oven. Convection cooking modes are: convection bake, convection roast and convection convert. The convection convert mode adjusts cooking time for convection bake cooking by alerting you to check your food when it is likely to be done. The convert mode assumes that convection baking takes ¾ of the time that a conventional baking recipe does since convection cooking cooks faster. The convection fan and built in heating element are designed to circulate heated air throughout your oven and prevent “cold spots”. This produces much more even temperatures throughout the oven than non-convection cooking. Convection cooking should also reduce the need to rotate food in different rack positions. You may also choose not to use convection, just conventional bake or broil modes. This is good to know if you are baking a soufflé, for example, and don’t want it upset by the convection fan. There are other foods that you may want to cook without convection as well, basically whatever may be most upset by a fan while cooking. It’s easy to switch the convection fan on or off, depending on what you’re cooking. From the control panel, you can also set your targeted cooking temperature to work with your temperature probe. The temperature probe is inserted into whatever cut of meat, for instance a roast, or any other food you may be cooking. Set your desired temperature on the control panel and the temperature probe will automatically detect when that temperature is reached. It will then switch the oven to a warming temperature and alert you that your food is ready to take out of the oven. The best thing about the temperature probe is that you don’t have to cut into your expensive roast to check “doneness”. The probe will tell you when your food has reached your target temperature. Your target temperature should ideally match the recommended food safety temperatures. The oven timer can be set for multiple cooking times and also allows for delayed starts. That way you can set your cooking times and be confident that the oven knows when to start and stop. A chime will alert you when your cooking times are met, but you can alternatively set this feature to silent. The oven self-cleaning cycles can be set for 2, 3 or 4 hours and can start on a delayed setting. Self-cleaning uses the oven’s maximum heat to burn off oven residue. This oven does not have a quick clean steam feature. It’s also good to know that your oven is also pre-set to turn off after six hours of continuous cooking. This energy saving feature, however, can be overridden. The oven is also pre-set to display Fahrenheit temperatures that can also be changed to Celsius. The oven door and oven temperature controls may also be locked from the keypad to prevent kids or anyone else from opening the oven when its hot, or changing the settings. Steam Cleaning mode is designed for a lighter oven cleaning process than is performed in the self cleaning modes. Just pour a cup of water on the floor of the oven and press the “Steam Clean” button on the control panel. The cycle will run, turn the water into steam and then chime when it’s done. The range also features a Star K compliant Sabbath mode when used with the “bake” setting. The oven door features a large oven window to see your food easily without opening the oven door and lowering the oven temperature. The oven light may be used while the oven door is shut to better see inside the oven. This extra large window is known as the “Visualine” window and is a great feature to have in your range. The storage drawer is immediately below the oven. It is just for storage and doesn’t include any warming options. The drawer is insulated from the oven above so you can be confident that whatever you put in there will be safe. This range is configured for natural gas, but you may purchase a propane conversion kit separately, the PN# GRLP4 when you order your range. From the top of the range control panel to the bottom of the range, the height is 46.62 inches. The adjustable legs on the bottom of the range may tweak the height by about 1/8 inch. The height from the rangetop to the bottom of the range is 36 inches. The width of the exterior of the range is 29 7/8 inches. 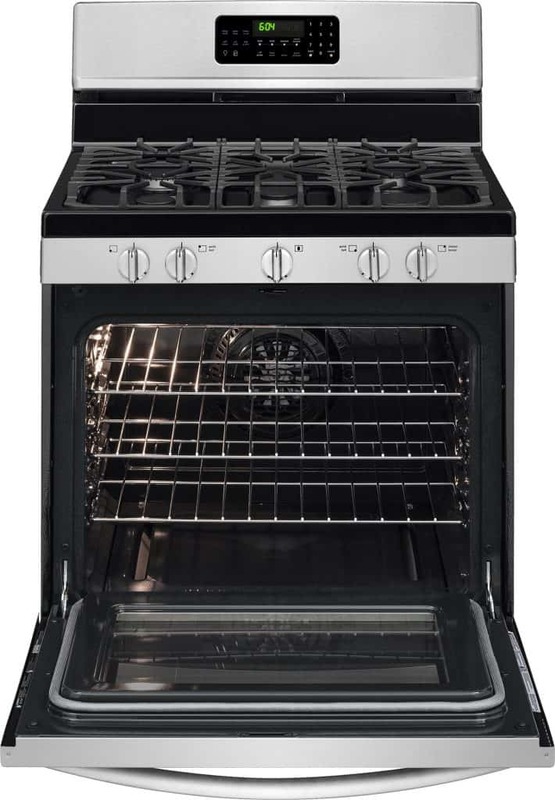 The depth of the range is 29 ¼ inches from the oven door handle to the back of the range. The maximum depth with the oven door open and extended is 46 9/16 inches. The range shipping weight is 205 pounds. The voltage rating is 120V / 60 Hz / 5 Amps, Amps @ 120 volts = 5 amps. The oven vent is located in the middle of the seam the splits the top of the range, where the control panel is, and the rest of the range. It is located in the area just below the oven control panel and displays. So, make sure not to put anything in front of that area to block the vent. The warranty for the FGGF3059TF is a limited one year warranty. You may also buy an extended warranty (see purchase options). The warranty coverage starts from the date of purchase. The parent company of Frigidaire (Electrolux or a related Electrolux entity) will pay for replacing and repairing any parts of the range that “prove” to be defective in workmanship or materials. To be covered, the range has to have been used and maintained properly. It also cannot have been used for commercial use. Cosmetic damage or wear and tear are generally not included. This warranty assumes purchase in the United States or Canada and only applies to those two countries. If purchased in another country, check the applicable warranty. You also have the option of adding a Square Trade protection plan. These plans provide protection up to five years for this range, see the purchase options below. This range is a great choice for convection cooking, given its “true convection” heating element built into the convection fan. It’s also nice to have a temperature probe to tell you when your food is ready. It’s the replacement for the FGGF3054MF, now discontinued by Frigidaire. These two models are nearly identical. The FGGF3059TF will save you time when you use convection. Convection cooking generally takes about ¾ the time of conventional cooking and will also cook your food evenly. The temperature probe, whether used in convection mode or conventional mode, will also ensure your food is cooked at the right temperature for serving. You won’t have to worry about under-cooked and potentially dangerous food. Having five burners with an small griddle option may also be a nice benefit. Also, consider all the cooking options you’re getting with the timer and control features built into the control panel. If you value all of these features at a decent price, and don’t want or need a “high-end” pro-style range, then this range is a good buy. If, on the other hand, you are more “manually” focused and don’t think you need convection cooking, a temperature probe or five burners, then take a look at this alternative Frigidaire model, the FFGF3051TS. The Frigidaire FGGF3059TF (replacement for the FGGF3058RF and FGGF3054MF) has just about all of the features you’d like in today’s range models at a pretty good price. Many reviewers are happy with the convection cooking system and temperature control that the temperature probe gives them. Others like the grill with the middle burner and 18,000 BTU burner. Negative reviews came from those who had a tough time cleaning the model that is black instead of stainless steel or those who had a defective range. You can buy extended protection if you’re concerned, but the overall rating from all of the reviewers is very high. Also, to see the FGGF3059TF with a low price guarantee, free shipping, and extended warranty options and even appliance package deals, see it on Abt.com here. The FGGFF3059 range offers a lot of features for the price. These include a large true convection 5 cubic foot oven with temperature probe. Also remember that you’re also getting five burners with simmer and high powered sear settings as well as wok capability. The rangetop also includes the small griddle option, a lot of oven control settings, timing options and self-cleaning, even steam cleaning. These features on a range like Wolf will cost nearly five times as much. They probably won’t even include a temperature probe! See it again with a low price guarantee, free shipping and extended warranty options on Abt.com. Abt was founded in 1936 in the Chicago area by David and Jewell Abt. Abt has been selling online since 1996, about as long as Amazon. Abt has an A+ rating from the Better Business Bureau (BBB). Abt.com has thousands of products and offers low price guarantees, free shipping in the continental United States for many products (including the FFGF3051TS) and extended warranties.